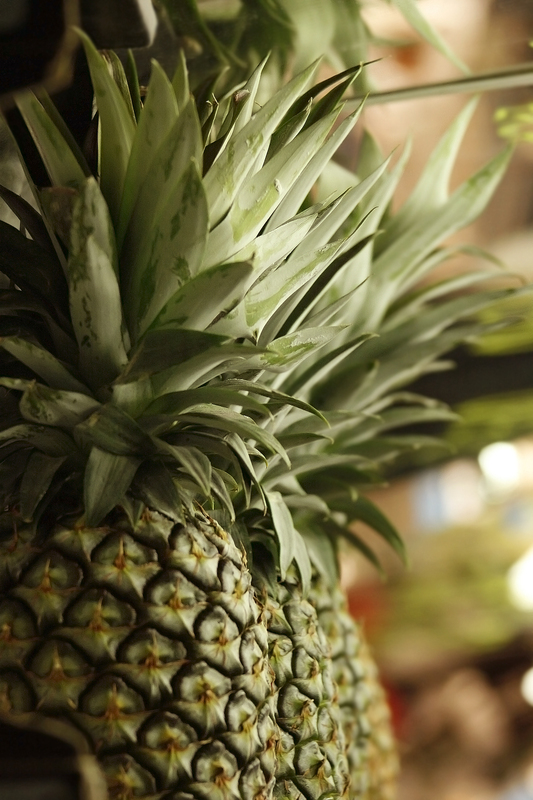 Just today I learned that pineapple is excellent for the throat...for both healing and preventing laryngitis. I can't think of a more delicious remedy than fresh pineapple juice. Photo courtesy of stock.xchng. Hey guys. I hope you all have had a great weekend. Mine has been a mixed bag. See, I had a cold last week. First legit cold in nearly a year, but a cold nonetheless.My immune system, fortunately, is pretty strong, and I thought the cold and I were done. That we’d kicked one another to the curb in record time. But then it was like “Not so fast, suckah!” and promptly boomeranged back to me early Friday morning. . .in the form of pure evil, I mean, laryngitis. Holy throat chakra, Batman! I haven’t lost my voice in over two years. I thought was on a roll in that department. Long story short, I’ve been on vocal rest since Friday, only talking when absolutely required. I’ve missed some work, and had to miss Khat’s birthday celebration. Which really sucked. But I would have have been bad, bizarre company with my squeaky vocal range and weird hand gestures. So alas, not being able to talk has given me time to listen. To myself and others.This has been oddly refreshing, rejuvenating, even. I could get used to this. And one of the things that dawned on me while giving the ol’ gift of gab a break is that I really ought to post on here more often. And I quickly realized that I’ve been letting arbitrary rules I’d “set” for myself determine what my posts had to be. 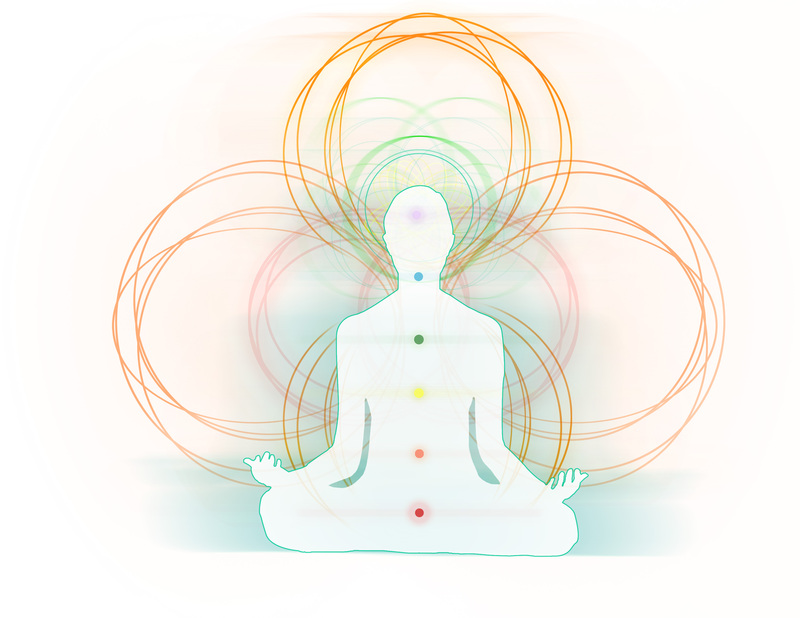 Spending time in quiet, and in meditation, is helping re-balance my chakras. (Dear Lord, did I just type that...it sounds so hokey. But it's TRUE!) Photo courtesy of stock.xchng. The advice I often give my students and clients about letting go of the all or nothing mentality? I SOOOO wasn’t following my own advice in terms of this blog. I’d backed myself into the corner of thinking that most of my posts needed to be full-on recipes, photographed by me, and with some sort of a little story to go along. I was “shoulding” myself to death! That corner and all that “shoulding”? Very limiting. Why stay stuck in a corner when you have a whole world to explore? I’ve decided to come out of the corner and toss my own rulebook. So from now on, there might be more posts, but maybe not every single post will be a recipe. I live in NYC, and this place can be absurd and inspiring, sometimes all at once. Would you guys mind if I posted random, funny and/or poignant tidbits and photos from my day to day life? Peacock pose. Central Park, NYC. I totally look Photoshopped in, right? But it's for reals. Photo by Marisa Train. I love Yoga, fitness, meditation, travel, nature, and Downton Abbey. You won’t mind, will you, if some posts delve into those topics? My friends are some of the most interesting and talented people I’ve ever met. You won’t mind, will you, if I periodically post a “day in the life” of some of them….such as my friend Alena who is currently a Broadway performer in the musical “Sister Act”? In what areas do you have a tendency to think (and maybe act) in an “all or nothing” fashion? Are you game to change that tendency and see what happens? Or maybe you’ve made such changes already…how’d that go? Any tips for the rest of us? Feel free to leave your thoughts in the comments. Would love to read about others’ “all or nothing” tendencies. I can’t be the only one who thinks this way, right? Join us for a presentation by Omar Ali, Associate Professor of African American and Diaspora Studies at the University of North Carolina followed by a screening of Afro-Iranian Lives (46 min, 2007), a documentary by Iranian filmmaker Dr. Behnaz A. Mirzai. Persian Sugarplums. These are simple and can be made quickly with any dried fruits and nuts you have on hand. Merry Holidays, everyone! Does anyone really know what sugarplums are? What confection, precisely, is that Sugarplum Fairy in The Nutcracker dancing for anyways? 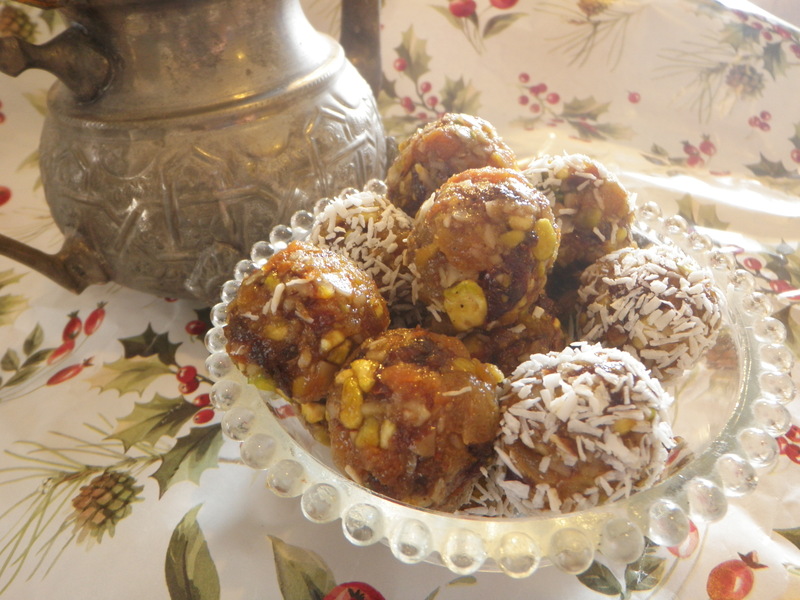 Turns out they’re balls of dried fruits and nuts, sometimes with spices added in, perhaps coated in powdered sugar. Well, besides sounding Christmasey, this all sounded very Persian to me. 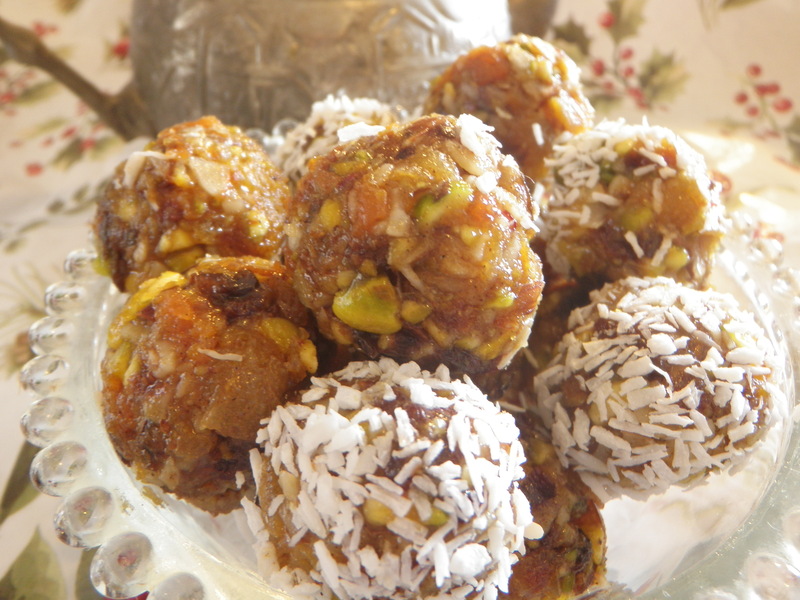 So I tooled around online, found some simple sugarplum recipes, and tweaked them to add a Persian twist. Voila! Beautiful, tasty, festive holiday treats. Simple to make, tasty, and these goodies actually taste better as the days go on. Time in the fridge give their flavors time to meld. They’re plenty sweet, but perhaps a nice change of pace from all the cookies you might be enjoying lately. These easy to make sugarplum are fast to prepare, and excellent with a cup of perfectly brewed hot tea. Note: You can play around with the proportion of fruits to nuts, the types of fruit and nuts that you use, and the spices. This recipe is extremely flexible. 1. Chop nuts into pieces, either via hand, crushing them with a rolling pin inside a bag, or use a blender or food processor to pulse once or twice to chop the pieces. Chop or food process/blend the the fruits as well. Remove fruit and nut mixture from food processor or blender (if using), and set aside in a bowl. 2. Add honey to another bowl. Infuse honey with saffron and hot water, and then add in the pumpkin pie spice or Persian spice blend and vanilla (if using). Mix well. 3. Combine honey mixture with fruit/nut mixture, and mix very well. 4. Use your hands to form this mixture into balls. (Mixture will be very sticky. Keep a dampened cloth handy to wipe down your hands periodically). Roll in confectioner’s sugar or coconut flakes, if using. Refrigerate in an airtight container and enjoy at your leisure. Happy Holidays, Merry Christmas to those who celebrate it, and wishing every one of you a fantastic 2011! As the seasons shift, so do my eating and cooking habits. Some days I don’t cook at all–relying on smoothies, salads, and chilled soups for sustenance. The “Big Oven” gets the summer off, unless there’s a cake or cookie or entree I just can’t force bake in the toaster oven. With the summer equinox fast approaching, I’d begin to notice the reappearance of gorgeous yellow squashes at the farmer’s markets. Last week, I grabbed a couple, figuring I’d grill them or eat them raw (I like to dip them in hummus). But they sat there for a day or so, beautiful yet uninspiring. Until I read a post on zucchini kuku by my amiga over at My Persian Kitchen. Kuku, you ask? Why yes, it’s an Iranian omelette that’s a perfect marriage of veggies, spices, and convenience. 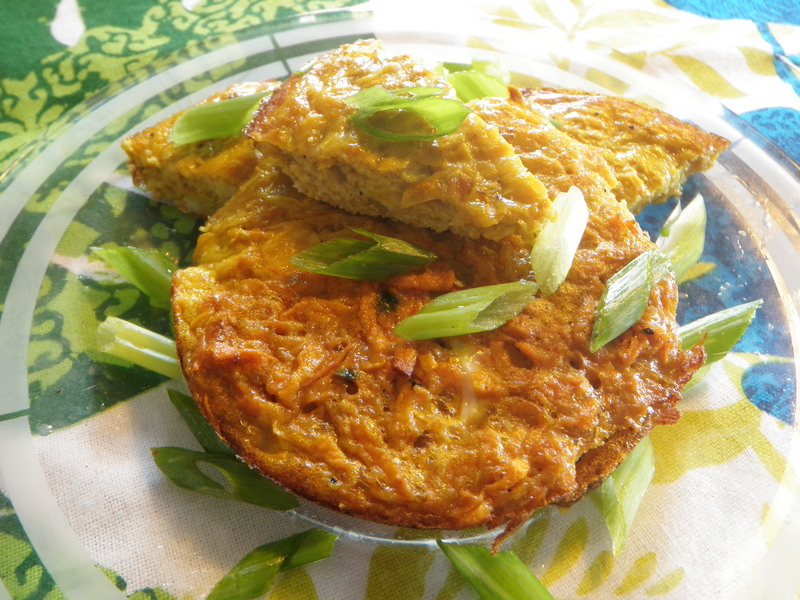 It’s sort of a cross between a frittata and a souffle. Without, of course, the souffle drama. Because you know that in the kitchen, I do not do drama. Well, at least not deliberately 😉 I figure there’s enough inherent drama and suspense in cooking and baking as it is. 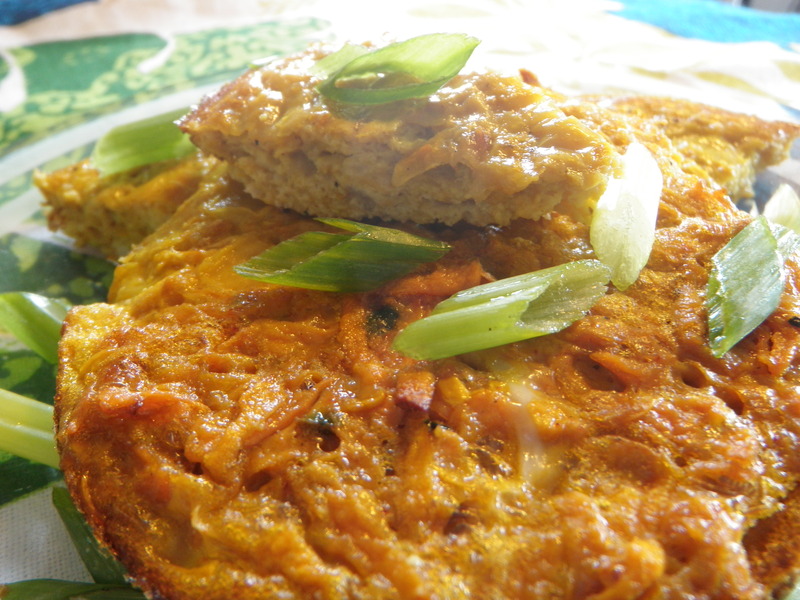 As for kuku, it’s the perfect summer dish, because it travels well and tastes great hot, warm, or even cold. It’s filling but not heavy. You can bake it in the oven, or cook it on the stovetop. This time, I used my toaster oven, which worked perfectly and kept the Big Oven out of play, and from heating the house. So that’s exactly what I did, and in the process, found a new dish to love. A dish that perfectly straddles the shift between spring and summer, and could easily straddle the shift between summer and fall, for that matter. 2. Add cooking fat to a cold skillet (skillet I used was an 8-inch cast iron skillet by Lodge). Heat over medium low. 3. Add in the onions and saute, stirring often, until translucent (about 5 minutes). Add turmeric and garlic to onions and saute for another minute or so. 4. Add in the grated squash and sweet potato. Add salt and pepper and mix. Cook until softened and the moisture is absorbed. 5. As the vegetables are cooking, whisk the eggs and baking soda together with either a hand whisk or a fork. If you desire a more yellow color for the egg mixture, add another pinch of turmeric and stir well. 6. Allow the veggie mixture to drain and cool (I used a colander and a bowl to catch the drips underneath, plus patted the mixture several times with a kitchen towel to further push out excess moisture). 7. Clean out the skillet, regrease with cooking fat or cooking spray of choice. In a large bowl, mix together veggie mixture and eggs, then pour it all into the skillet. Bake at 375 for 20-30 minutes (my kuku was done at 25 minutes, but your mileage may vary due to variation in the moisture of the mix). You’ll know it’s done when a knife or fork inserted into the center comes out clean.